For better and for worse, rock music and drugs will forever be inextricably intertwined. Bill Maher once joked “I wouldn’t recommend heroin. But it hasn’t hurt my record collection”. But on the dark side, drugs have been responsible for the premature demise of far too many rock musicians and fans. 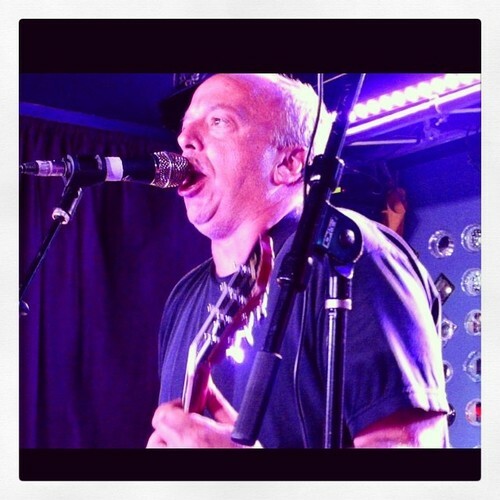 In early 2011, Gene Ween was seriously in danger in becoming the next casualty in the rock world. Gener was losing his fight with alcohol and drug addiction and it all came to a boil one sad and ugly night on stage in Vancouver when his condition was so bad that he was incapable of performing the material and the rest of the band walked off the stage on him. After the tour, Gene Ween went into rehab in Arizona and stopped touring with the band. After his first solo album was released, Gene Ween officially broke up Ween in 2012 and began to perform under his birth name Aaron Freeman. Its four years later and Freeman is still sober and ready to talk about the dark years. The new album Freeman was released last week on Partisan Records and its an honest and frank discussion of the journey to sobriety. The band is also called Freeman and they played two album-release shows last week at Mercury Lounge and Baby’s All Right. At the Baby’s show, Freeman opened the set with three straight songs from the new album, the third of which is perhaps the most poignant song “Covert Discretion” which essentially tells the story of the Vancouver meltdown. But for the packed house of Ween fans, the old Gener didn’t disappoint as the band whipped out plenty of Ween material, including some deep cuts. We are streaming “Transdermal Celebration” from Ween’s 2003 album Quebec. But ultimately this show was all about the new material, and Freeman closed the set with a run of songs from the album including the confessional “(For a While) I Couldn’t Play My Guitar Like a Man” which closed the main set and that we are streaming below. Freeman closed the show with two eclectic covers and from the crowd reaction, the fans seemed pleased. But make no mistake, there is some animosity among the Ween uberfans over the fact that “Gener” broke up the band. But as the album Freeman makes clear, without the breakup of Ween, Aaron Freeman would likely have died. Or as he sings on “Covert Discretion”, “be grateful I saved me from myself”. Freeman will return to shows in the Fall with an extensive tour of the East and Midwest. The next local show is October 4 at Bowery Ballroom. This set was recorded by House FOH Devin, who provided a superb live mix of the multitrack. There are also cardioid microphones installed on the lighting rig about 15 feet in front of the stage. In post-production, I mixed the two sources and the results are quite excellent. Enjoy! If you download this recording from NYCTaper, we expect that you will PLEASE SUPPORT Freeman, visit his page at the Partisan Records site, and purchase Freeman from the Partisan’s site [HERE]. Thank you for offering this Freeman show! Already got the album, I agree, go buy it if you haven’t, many great songs and very well produced with smooth sound. Thanks much for this! I’m loving the new material in it’s live form. The recording sounds great too. I was at both release shows standing by the stage. I can’t wait to hear this. I love the album.